Welcome friends to the First Friday Home Tour for the month of August. 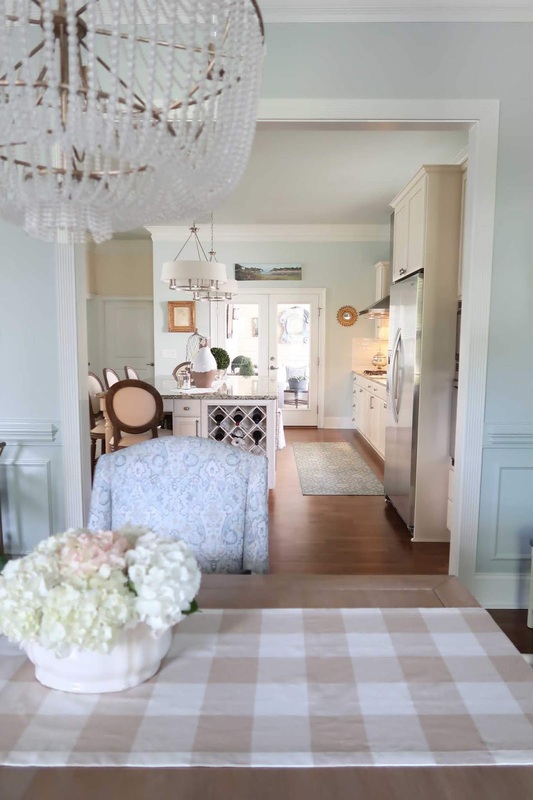 It's toasty outside so I hope you'll grab an iced tea and join Tracey of Porch Daydreamer for this fabulous home tour. I am grateful each month to the ladies who participate in these home tours. I know the readers of Poofing the Pillows enjoy a peek into real homes and this one is exceptional. Tracey will be telling you about her home and blog. Any words you see highlighted in red are clickable and will take you to a spot on her blog. Let me just say, this home gives me all the sighs with the color scheme and perfect accessories. There's a lot to learn and enjoy here! Hey, friends! My name is Tracey the Master of Chaos at Porch Daydreamer, in Charlotte, NC! My blog and website started a little over a year ago when I was faced with some big life changes. In just a few months I lost my job, my son left for his first year in college, my mom needed emergency surgery on her back, and my dad's mental health started to decline. While launching the blog I was unemployed, became an empty nester, and was a part-time caretaker. I've learned I can handle A LOT! Oh and I must mention I've been a single working mom for over 15 years, so yep I'm tough! It seems odd I would start a blog during this stressful time, but it was the one thing that helped me survive and move forward. 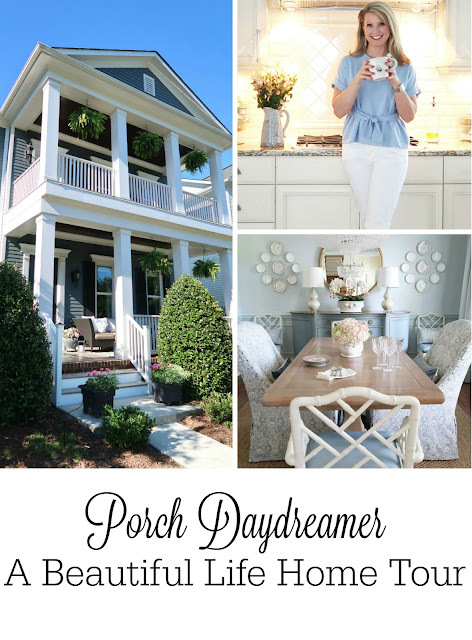 Porch Daydreamer is where I get to express a variety of passions from home decor, to painting, home improvement, and general things that make life better. As my tagline says, "Creating a Beautiful Life" one project at a time! The blog's name goes WAY back and if you want to know what inspired it please read Get to Know Me for the full story. Porches are also a love of mine and I've been lucky enough to have a front porch on the past three homes I've owned. My current home has three! Two up front and one in the back, so I am a "Porch Daydreamer"! This spring I gave my front porch a makeover and sat out there ALL of the time. Mick, who is a Maltese, loves to enjoy this space too and keeps me protected at all times from intruders. 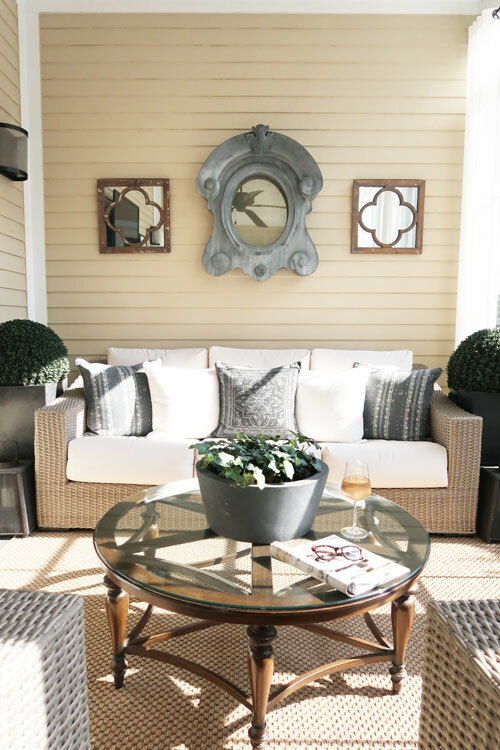 The front porch makeover became all about escape and getting that "sand in my toes" beach house feel. Not only did I get creative with maximizing this space, but also tackling a porch swing makeover wrapping the chain in rope and transforming the finish from black to driftwood gray. The other porch, where I lounge is at the back of the house right off the kitchen. It's a little more private so I can be out there in my PJ's. This is my "football" room where I watch both my Clemson Tigers and my son's college team play as the cooler weather of fall approaches. Notice something? The back porch is a different color than the exterior of my home. I wrote a whole blog post about that decision and have never regretted it! This is the best spot for entertaining because it is right off my kitchen with two large double doors. My family and friends will sit out here with me for a glass of wine and a chat. The other place we hang out is in my kitchen around the HUGE island! I'll give my mom credit for this design. She realized I had a ton of unused space and could maximize it with an island that seats 5. This is a huge bonus considering there isn't room for a kitchen table, so this truly is the main hub of my home. Over the years I've changed the counter stools, added little things to the island and updated the pendants. Just recently I added a sitting area behind the family room sofa and I love the conversation area the two little slipper chairs create with a mirrored console to hold a drink! 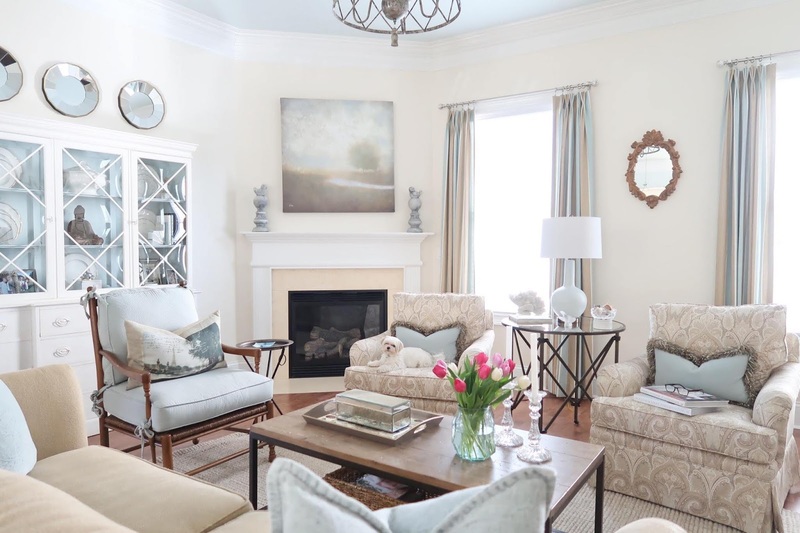 Someone recently asked me what my home style was and I decided eclectic with a coastal vibe! What do you think? My master bedroom, since I am single, is feminine and soft. Blush pink is at its core this spring and summer! I've had the same white duvet, dust ruffle, drapes, and wall color for more years than I'd like to admit. I've been able to redecorate around all of it with ease. Here is a fun shot from Valentines Day. Then there is the other side of the room, where I did a complete overhaul. It was such an odd space that I decided a small daybed would be perfect! This is where I lounge, play on social media, fold laundry and even nap. Shhh, a secret - the artwork above the daybed has been modified from the original and the artist would probably not like that. I ordered a canvas online and decided it was too vibrant. What did I do? Whitewashed it of course. There isn't much I won't paint! Like my master bathroom cabinets - they used to be an espresso stain. After living in my home for 8 years, redecorating and refreshing has become important to me. This past fall I decided to participate as a guest in the One Room Challenge, where I had 6 weeks to makever a space. It about killed me! Fortunately, the results came out beautifully but know that it came with many challenges including painting the room three times. The whole family loves it! The biggest challenge was taking that credenza from a dark brown stain to a beautiful blue. That leaves us with this one last space I'll share with you. This was also a One Room Challenge makeover space last fall and I painted EVERYTHING. I had the time being unemployed and strapped for cash. My hard work paid off and now I have an office that inspires me. Part of the makeover also included a loft area and my son's "man cave". Literally, I spin between my day job and the blog because now I work from home in a role that I love and pays the bills! Come, sit on the porch with me and daydream about creating a beautiful life! Thank you, Tracey! You knocked my socks off with your beautiful home, your great attitude and outlook, and your work ethic. Readers, please be sure to comment and /or visit Tracey at her blog, Porch Daydreamer. More home tours can be found here. Beautiful home. Somehow I have missed her blog in Blogland. I look forward to popping over and checking it out. You have a beautiful home and make us all realize that a person that works hard...and long can also take the time to have style! I love it! You are inspiring to so many hard working ladies! Hugs, Diane And thanks Stacey! Diane that is so sweet! Yep hard work is at the core of all that I do and I love that it is inspiring too. Having a blog to share what I love has been the best gift ever! I throughly enjoyed Tracey's home tour. I will be rereading several times to take it all in. I can tell Tracey is a gifted designer. Thanks for the home tour. Stacey, THANK YOU! 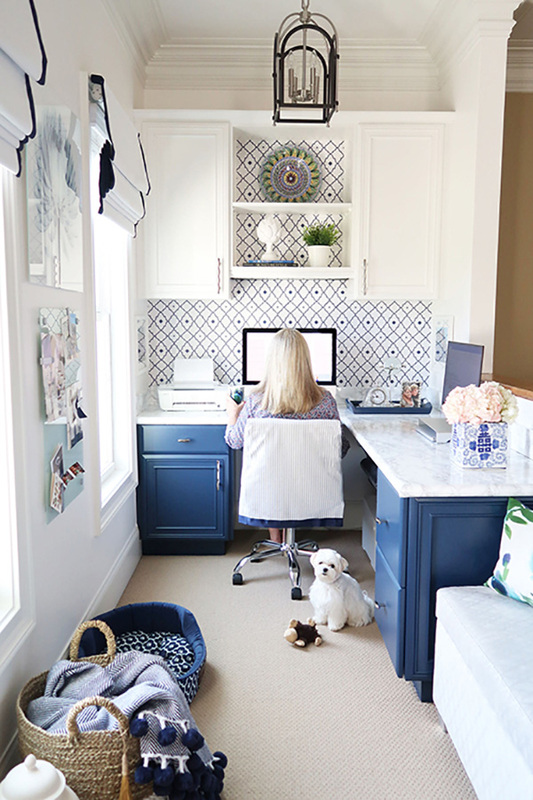 Opening up your blog to my home is like opening up your home to a new friend. It means a lot! I appreciate your support so much and hope your readers enjoy the tour around my home! I am so excited to see that you featured Tracey! I have been following her blog and IG and just love her style. Such a beautiful home and a lovely person! You were right Stacey! It is a beautiful home. I love the colors throughout and the clean, fresh look it has. I am envious that Tracey gets to live there all by her self!! Absolutely stunning, just LOVE the touches of blush! GREAT BALLS OF FIRE....drop dead gorgeous house. Wow, such a beautiful and peaceful home. So nice to meet Tracey. You have beautiful porches, three, how neat. Your kitchen island is amazing. Oh my Stacey!!! Tracey's home is gorgeous. Love all those porches. Just beautiful. Happy Friday have a great weekend. Would love to sit on the porch with her sometime and get to know her better. She sounds like a super hero! "A strong woman" doesn't seem to cut it. Beautiful tour Stacey. Thanks for sharing it! Lovely home,would love to sit on either of her porches, love porches,thanks Stacey this was a wonderful tour. Awesome Home Tour, Stacey. Thank you for sharing Tracey's beautiful style. Wish I could attach her front porch to my house. I always love your home tours. Stacey ! Beautiful Home and you are a Beautiful girl!! I hope you find a woondeful companion to share your life ! !Take Care ! What a wonderful tour!Really gorgeous! I always enjoy your Friday Home Tours. I like Tracey's style. As much as I like looking at chippy, farmhouse style, I prefer living with nice, clean furniture finishes. 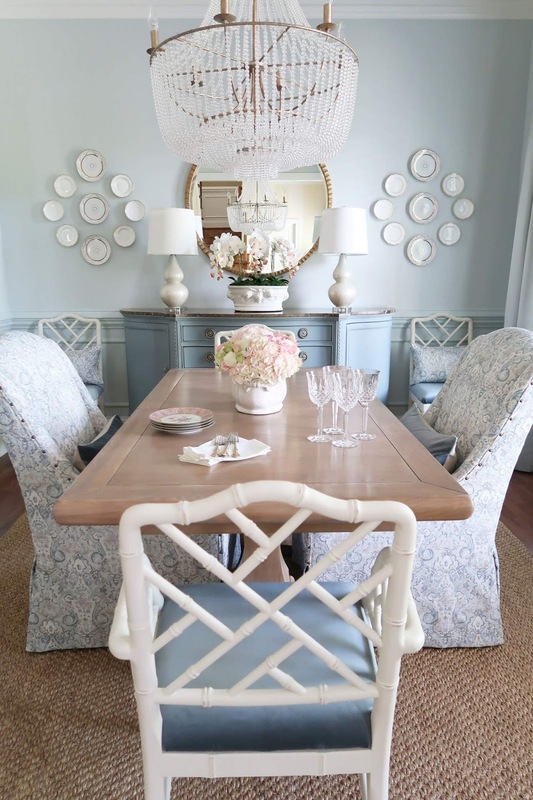 Her painted buffet is gorgeous! Stacey, what a gorgeous lady and home. I thoroughly enjoyed the tour and love her style! Thank you for sharing! Thank you for yet another fabulous home tour and introduction to a new-to-me blogger. Such a wonderful feature! I absolutely love Tracey and her sweet pup Mick. Not only does Tracey have a beautiful home, she's as kind and funny as can be, and I'm happy to call her one of my Instagram friends! I LOVE Tracey's home and her tenacity!...Her porch dreaming pays off both aesthetically and personally as she sounds like she sets her goals and accomplishes them with grace. I so loved this feature and introduction to her!....Thanks Tracey! I went over to read your "about" and am impressed. When I saw your picture I saw a beautiful woman who looked like she had everything. Your story is one of so many women, but I love when you said that you learned to forgive. What a blessing for your son. Now I think I'll go out to my porch and do some daydreaming. Happy Pink Saturday, Stacey and Tracey. Thank you for joining us to make Pink Saturdays even more special. Tracey your home is stunning. I am definitely a "porch daydreamer", and we are in North Carolina, too. I love outdoor living spaces. We have a front porch, sunroom, deck, terrace, and a gazebo in our woods. I drift from one to the other just to enjoy the outdoors. What a charmer of a home! love everything about it! Such a lovely home. I would never get stressed with a calming color palette like that. Love this post... Being a single mom myself (now an empty-nester), it's always a blessing to hear other single-parent-stories! Thanks, Stacey! Tracey's home - and she herself - just beautiful. I really enjoyed this tour, Stacey - thank you so much. Stacey your home tour is amazing, I love it all!! Thank you for sharing on Friday Features on Oh my Heartsie Girl last week!! This week I am featuring and have pinned your post to share!! This is a home is gorgeous. Thank you for sharing at Dishing it and Digging it link party. You are one of the features for this coming Sunday party. Thank you again. What a gorgeous home she has created! I am jealous of her 3 porches. :) When we were looking for a new home, a porch was a must have stipulation. Every room is delightful! Thanks for sharing with SYC. Wow, what a gorgeous home you've featured, Stacey. There's so much to love. Tracey is such an inspiration on all that she's accomplished as a single mom. Wow, this is one of the most beautiful houses I've seen lately. It's like taken from a magazine, from the beautiful porch to the doggie that makes it feel like home. The interior looks like was designed by a professional, everything is in the right place and nothing is too much. I will definitely try the whole plate wall decoration thing, I have too many beautiful plates which just gather dust in their boxes. Thanks for sharing! This home is so absolutely gorgeous! I am just scrolling through loving each and every picture. What a beautiful, classy home with such tasteful decor! 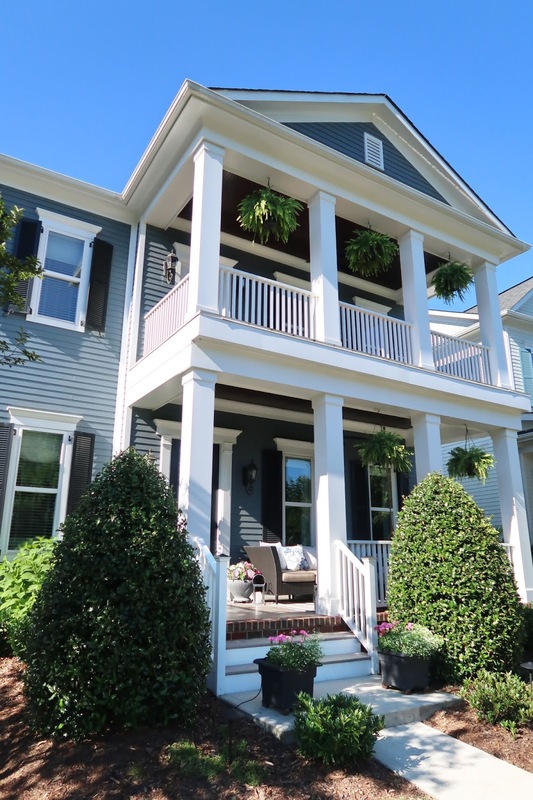 OMGolly - wow - first off this home is amazing and secondly - she is gorgeous! She looks like a prettier younger Christy Brinkley. I can't believe how awesome her house is - great choice - thanks for sharing.